Payasam /Kheer is the most traditional dish in the most of the south Indian homes on every celebrations and special occassions. Also it is one of the most favored 'prasadam' / 'offering' item. 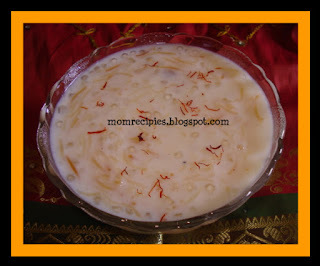 This is rich and creamy dish .This payasam is easy to prepare and equally delicious. 1) In a non stick pan add a tsp of ghee and fry vermicelli on low flame till it turns golden and raw smell goes off and remove them to plate and keep aside. 2) Saute sabudana with a 1tsp ghee for 5 minutes so that they puff up and cook easily. 3) Heat the milk and Cook sabudana till it appears transparent and soft. Keep stirring in between so that sabudana doesn't stick to the bottom of the pan. To avoid sticking and burning of sabudana. It will take 15 minutes.After the sabudana is cooked add the fried vermicelli and cook till the vermicelli is done .It will take another 10 mins.If the milk becomes thick you can add a glass of water or milk to make it loose.Then add the sugar and the cardamom powder. Mix well.When the sugar melts, turn off the stove. 4) Add ghee to a frying pan and add the cashews and raisins. When raisins puffs up and cashews turn golden brown , turn off the stove and add them to the cooked payasam and stir once.Garnish with saffron strands. Serve either cold or warm. 1) You can take half sugar n half jaggery for better taste. 2) If the payasam becomes thick you can add little milk to it and boil it for 2 minutes on stove or in in microwave. I love semiya payasom and this looks so so good.